If you were to ask people for one piece of advice when buying a new car there’s a high chance most would tell you to only look at cars with a Full Service History. There have been a number of studies over the years into how a cars service history is viewed by potential buyers. A missing or incomplete service history can impact the price of a vehicle by between 10%-20%. With the vast majority of buyers expecting a fairly hefty discount off the asking price. Does a full service history really make that much difference when selling a car? In this post, we’ll be looking at exactly what a full-service history is and also why it’s so important? A service history is essentially a collection of paperwork that documents the history of a vehicle. A full service history will provide details of all work carried out on a car, when it was completed and who by. 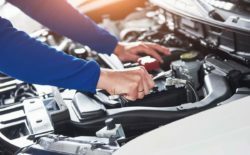 The service history should include the vehicle service book, which is a record of every service carried out on the car, with a stamp from the garage who carried out the work. For a very complete service history, some owners also retain all MOT certificates which detail advisory work suggested for the vehicle. They will then provide proof that the relevant work has been completed. A main dealer service history is one that shows that all work completed on a vehicle has been carried out by an official authorised dealer. This is often regarded as the most coveted service history. As it shows the owner has spared no expense in looking after their car. The key benefits of using a main dealer to carry out work on a vehicle is the peace of mind that only approved parts will have been used and that all staff are trained to work specifically on your make of car. A car with a full service history demonstrates to potential buyers that the vehicle has been properly maintained. As well as showing the work that has been carried out it also gives a buyer insight into how the car has been looked after. A well organised and detailed service history tells a buyer that the current owner cared about the car. While it’s not 100% proof of the cars history, it’s a very good indicator. For a seller, the service history is important as it helps retain the value of your car. A survey of 2000 people showed that buyers could expect as much as a 23% price reduction if no service history is present. With an average used car selling for around £7,700 that would equate to a £1,750 taken off the value of the car.